Looking for easy vegetarian dinner recipes that really scream autumn? 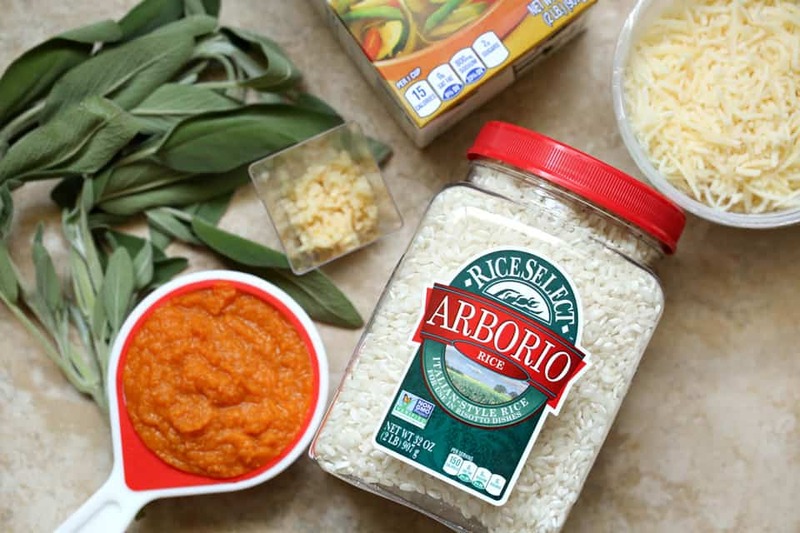 You’re going to love our pumpkin risotto recipe! It looks like a gourmet meal but takes less than half an hour to make. The best part? Everything goes into one skillet so you won’t have to clean up a huge mess! It goes great with a side of homemade garlic bread. Like many people this time of year, I’m absolutely crazy for pumpkin. I love everything sweet from pumpkin pie to lattes, but over the last year, I’ve really wanted to try making healthy pumpkin recipes. It’s such a powerhouse of a veggie, full of fiber, vitamins and minerals. On its own, it’s a relatively low-fat food. I just tend to add it to a bunch of sugary foods and it ends up becoming a high-cal dessert. Since I’m a picky eater and it’s one of the few vegetables that I really love, I’ve decided to try making more easy vegetarian dinner recipes with it! 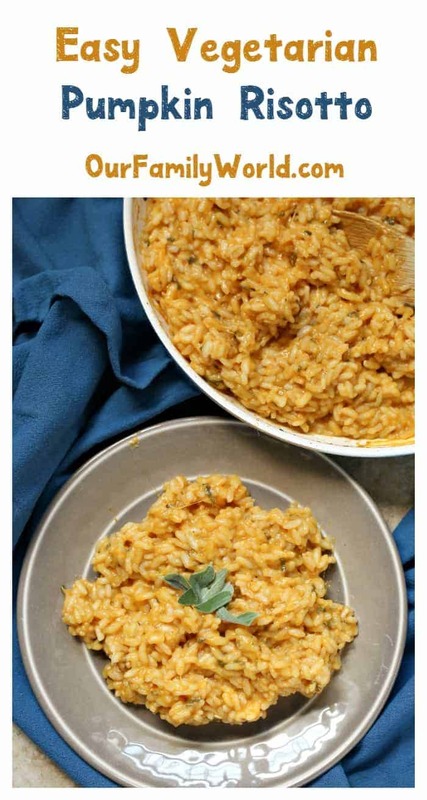 This yummy pumpkin risotto recipe is definitely a great place to start, don’t you think? Make sure you check out our video tutorial and grab the printable recipe card below! Check out our video, then print out the recipe card for later! Do you have any favorite easy vegetarian dinner recipes? How about an amazing healthy pumpkin recipe? Share in the comments! Cook the olive oil, garlic and sage together in a skillet. Add in vegetable stock, a little at a time, until it is cooked down and rice is soft (about 15 minutes), stirring frequently. Looking for more easy vegetarian dinner recipes using pumpkin? Check out our Creepy Spaghetti Squash Recipe! It’s perfect for Halloween! 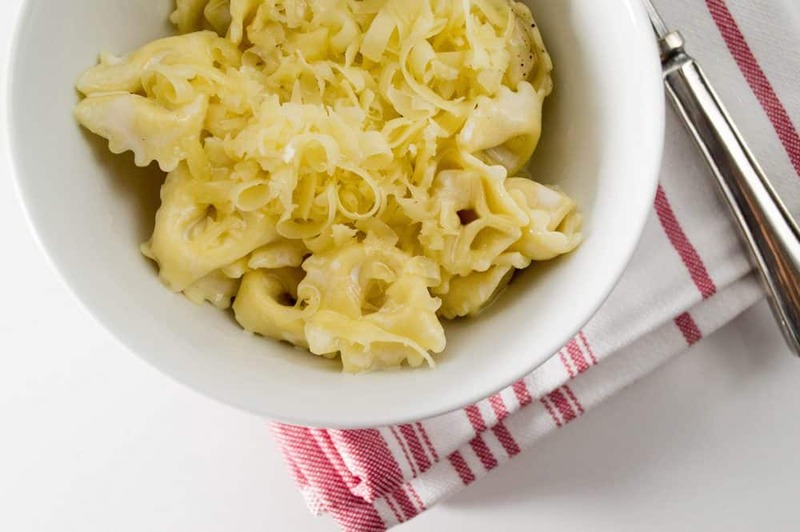 Another one of my favorite veggie recipes (without pumpkin, though) is our Rich & Creamy Tortellini! It’s full of cheesy goodness! This looks incredible! I love risotto but I’ve never tried a pumpkin version. Definitely going to remedy that! Thanks for sharing your recipe with us at Merry Monday this week! Oh wow! this is mouthwatering! I love a good creamy risotto..
Oh I just love everything pumpkin this time of the year! I love pumpkin risotto – delish! I’d put my “finger” on that delicious dish! Fall is an underrated season when it comes great food. When it comes to fall season, it is all about pumpkin recipes every where and this one looks absolutely delicious and unique among the crowd. A wonderful dinner idea to try out anytime! I have never tried a Risotto, but this one looks really good! I bet it is delish with pumpkin. Haven’t tried Risotto too but after reading your post/recipe, pretty sure I will make one soon. Thanks for sharing! This dish looks delicious, I think I need to start cooking again. I will try to cook this. I haven’t tried eating a risotto but I have tried a similar dish it is called Paella. This looks yummy. So spooky! I love it! This dish is very creative, I want to try it. I loooooove risotto, and trying pumpkin risotto makes me smile big time. I can’t wait to do it! Oh man, I love Risotto but I never get a chance to make it. Not up my alley but I have friends who are vegetarian and would love this. I can’t wait to try this out. I used to not be a pumpkin fan, but now with the pumpkin spice craze I’ve come to love so many things pumpkin. Oh yum this looks great. I will have to save this. 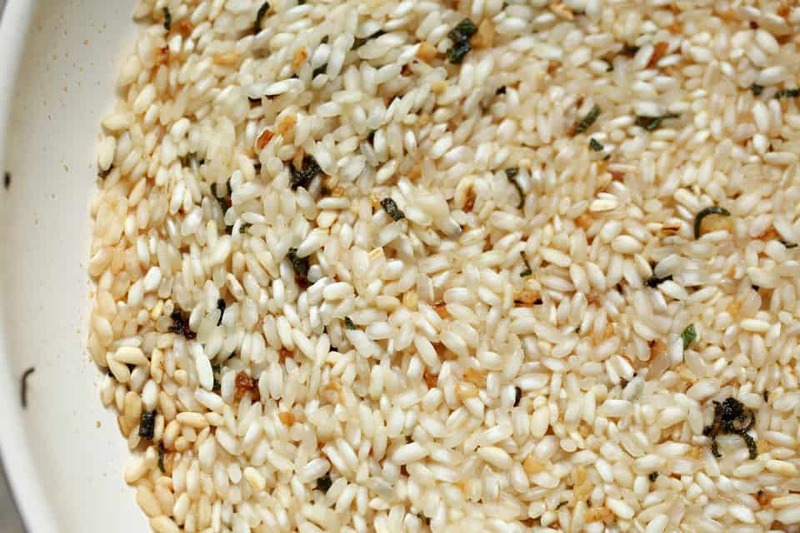 One question – I’m gluten-sensitive – would I be able to use brown rice with this recipe? The recipe was tried with Arborio rice. Unfortunately, we did not try it with brown rice. The texture may be different! I would give it a try though but use less stock.